Photo: Tropical Storm Isaac is due to become a hurricane by Monday. 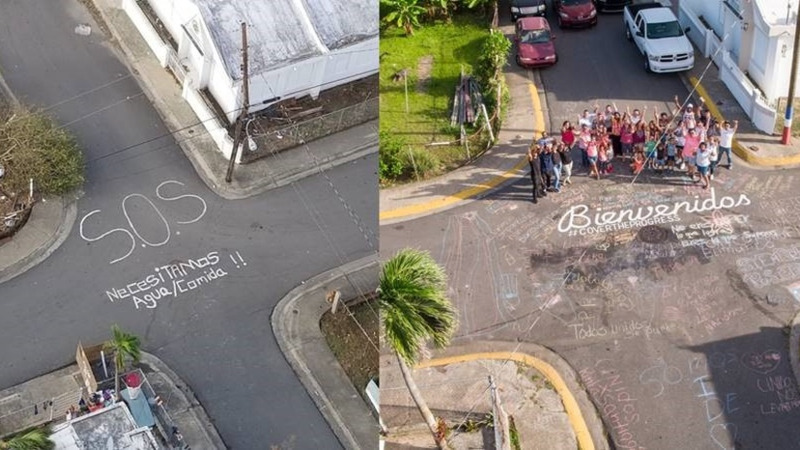 Photo courtesy the NHC. 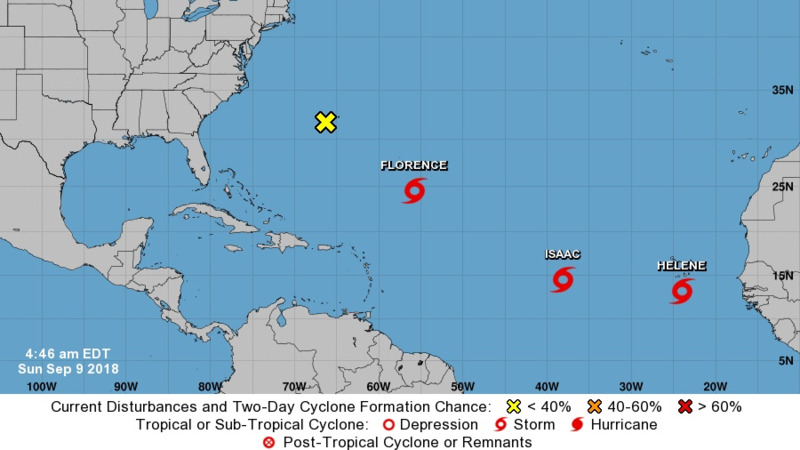 The US National Hurricane Center (NHC) continues to monitor several storms in the Atlantic, including tropical storm Isaac, which is on a path toward the Caribbean and estimated to become a hurricane by Monday. 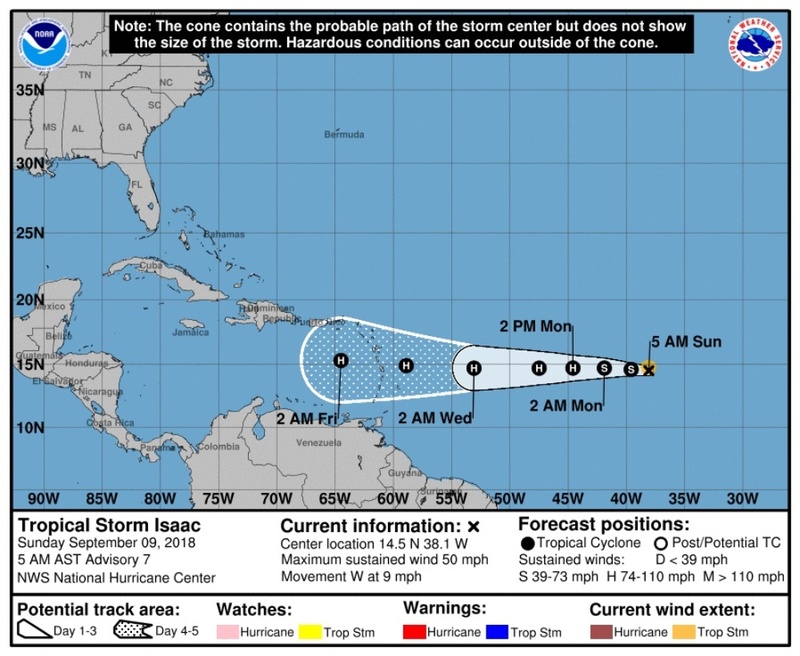 According to the NHC, at 5:00 am the centre of Tropical Storm Isaac was located near latitude 14.5 North, longitude 38.1 West. Isaac is moving toward the west near 9 mph (15 km/h). A westward motion with an increase in forward speed is expected during the next few days. Maximum sustained winds remain near 50 mph (85 km/h) with higher gusts. Strengthening is forecast during the next few days, and Isaac is expected to become a hurricane by Monday. Tropical-storm-force winds extend outward up to 60 miles (95 km) from the center. The estimated minimum central pressure is 1001 mb (29.56 inches). The Met Office said Trinidad and Tobago is not under any tropical storm watch or warning at this time. According to updates at 5am from the NHC, the center of Tropical Storm Florence was located near latitude 24.5 North, longitude 55.8 West. 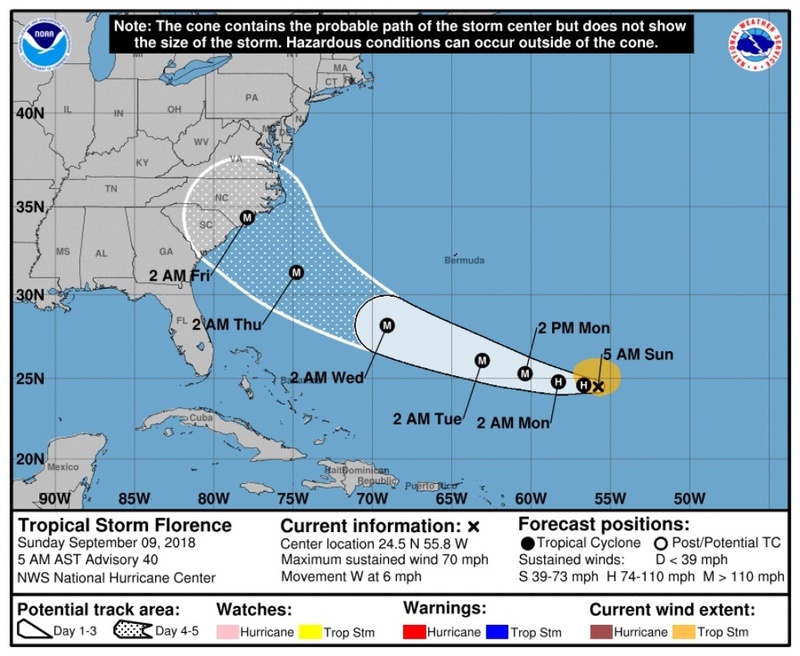 Florence is moving toward the west near 6 mph (9 km/h), and this general motion was expected to continue on Sunday. A west-northwestward motion with an increase in forward speed is expected by Monday, and that motion is forecast to continue through mid-week. Maximum sustained winds are near 70 mph (110 km/h) with higher gusts. Florence is expected to become a hurricane today and rapid intensification is likely to begin by tonight. 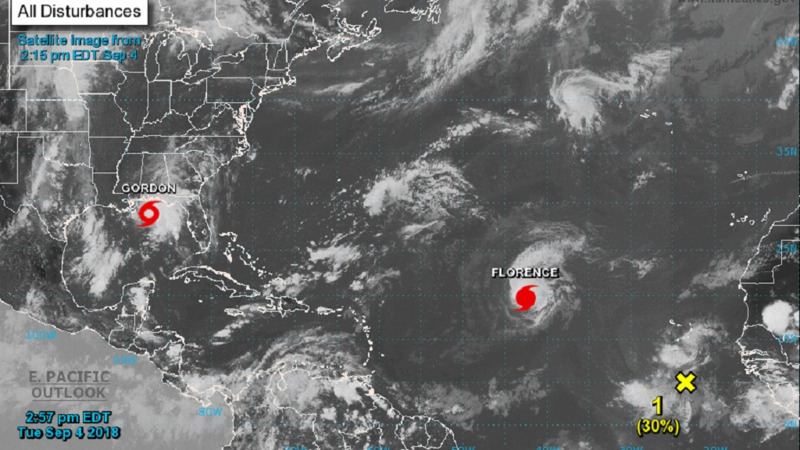 Florence is forecast to become a major hurricane on Monday. SURF: Swells generated by Florence are affecting Bermuda and are beginning to reach portions of the U.S. East Coast. These swells are likely to cause life-threatening surf and rip current conditions. Please consult products from your local weather office. 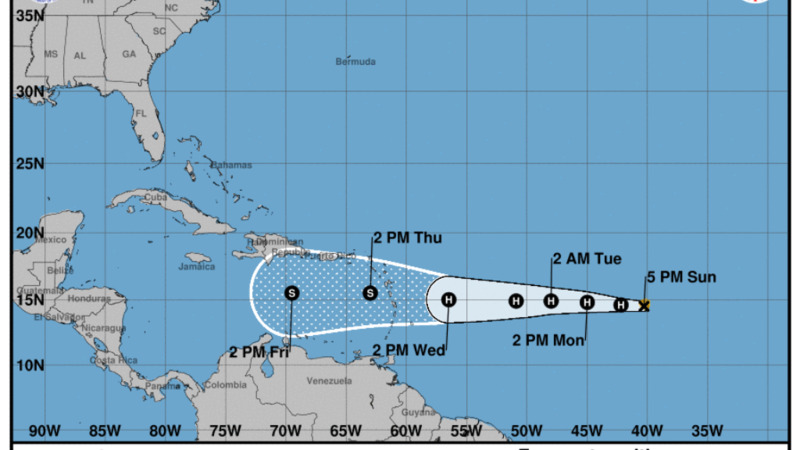 A third major weather system, Tropical Storm Helene, is headed for the Cabo Verde Islands. At 500 AM AST (0900 UTC), the center of Tropical Storm Helene was located near latitude 13.2 North, longitude 24.0 West. 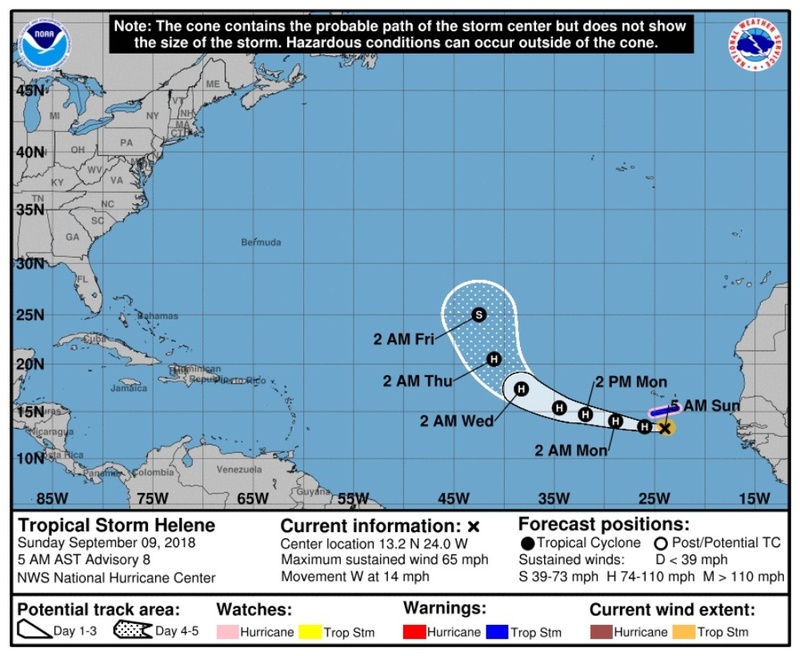 Helene is moving toward the west near 14 mph (22 km/h), and this motion is expected to continue through today. A turn toward the west-northwest is forecast to occur by Monday. Maximum sustained winds have increased to near 65 mph (100 km/h) with higher gusts. Additional strengthening is forecast during the next couple of days, and Helene is expected to become a hurricane later today. Tropical-storm-force winds extend outward up to 80 miles (130 km) from the center. The NHC and local weather agencies will continue to monitor these systems and will provide updates in due course.